One Two Tray: Plant it Here! With fall coming on I am sadly looking out the windows at my gardens which are in their last burst of bloom. The cool weather has revived all the impatiens that were limping and limp. The hortensias (that’s what the French call hydrangeas) are still in full blue and purple bloom and its time to drag everyone who will freeze off to the green house. Orchids and cacti will be going away for the winter in a day or two and all the garden rabbits will be stowed on their shelves for the cold season. I always take in the garden ornaments so they won’t freeze and blow themselves up. 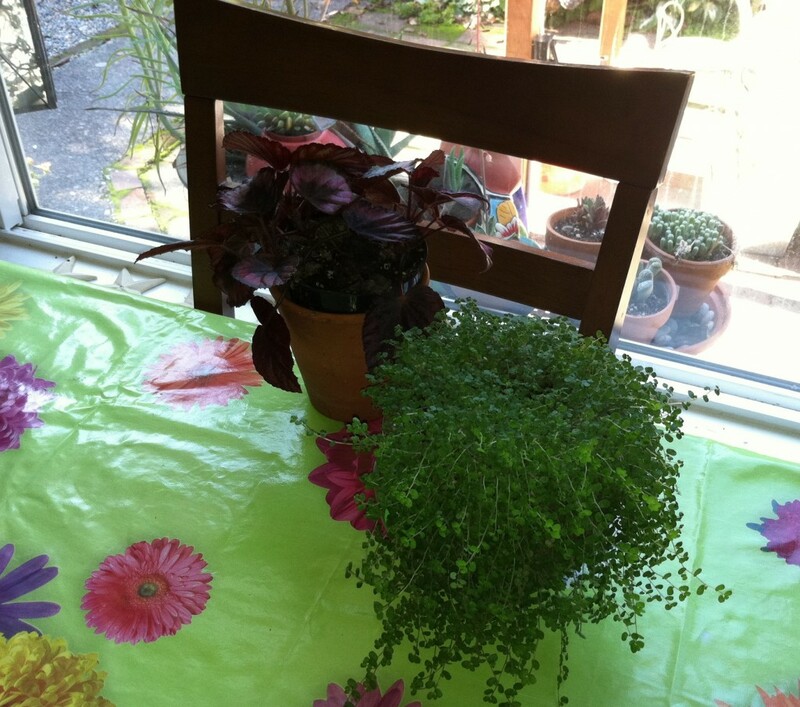 There are a few plants, mostly the major members of the begonia family, who will be moving indoors to bask on the kitchen table for a few months. This means I have to think about keeping them from leaking on everything when they get watered and about how to keep them under control and in one place. Raw materials. 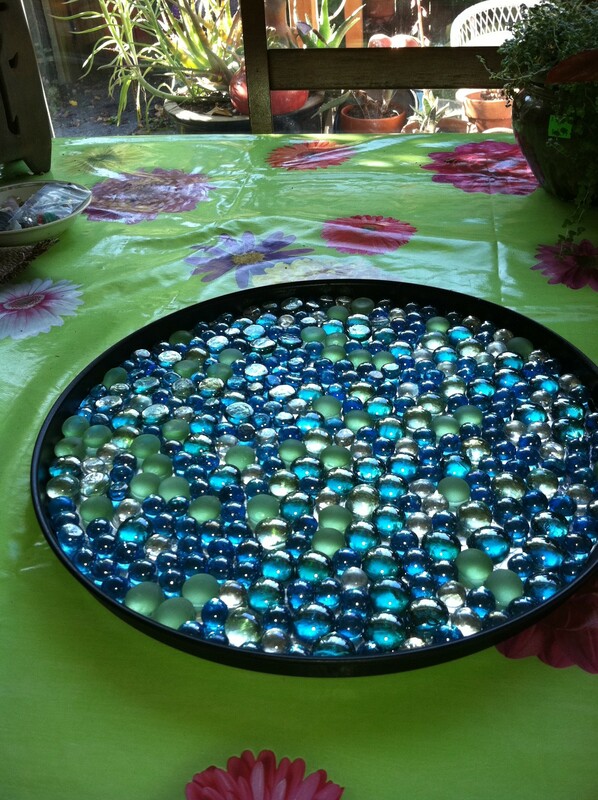 An old pizza tray, spray painted flat black, flat glass marbles, E6000 glue and tinfoil. 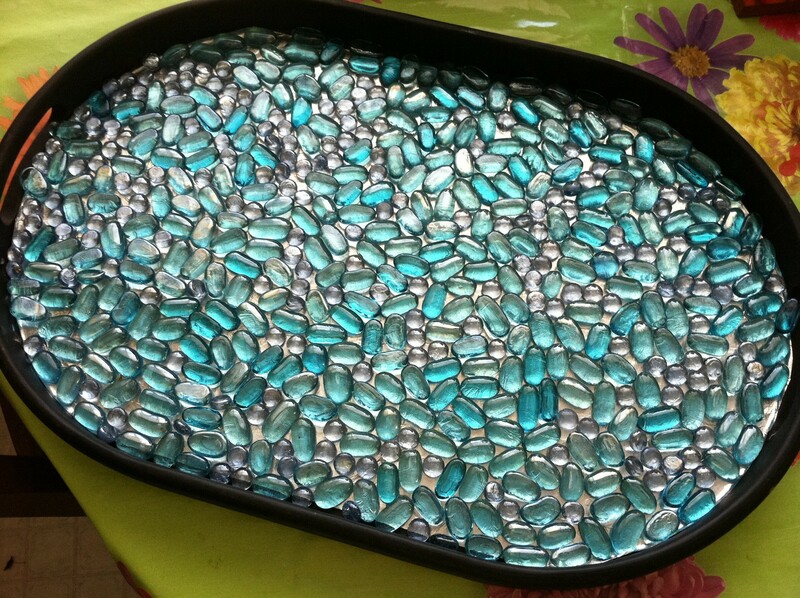 This is the tray I made for Robin's house. I used a great big tray made of wood I found at Goodwill. Holds a ton of plants and saves the furniture from wet pot rings. Solution: A cool plant tray that is made with recycled and renewable materials. Green plants and a green plan. Find a tray that will work for you. I found an old 99 cent pizza pan at a thrift store. A ratty old tray, a cookie sheet, anything that has a really solid waterproof bottom. Buy a can of flat black spray paint and give it a good coating of paint on both sides. 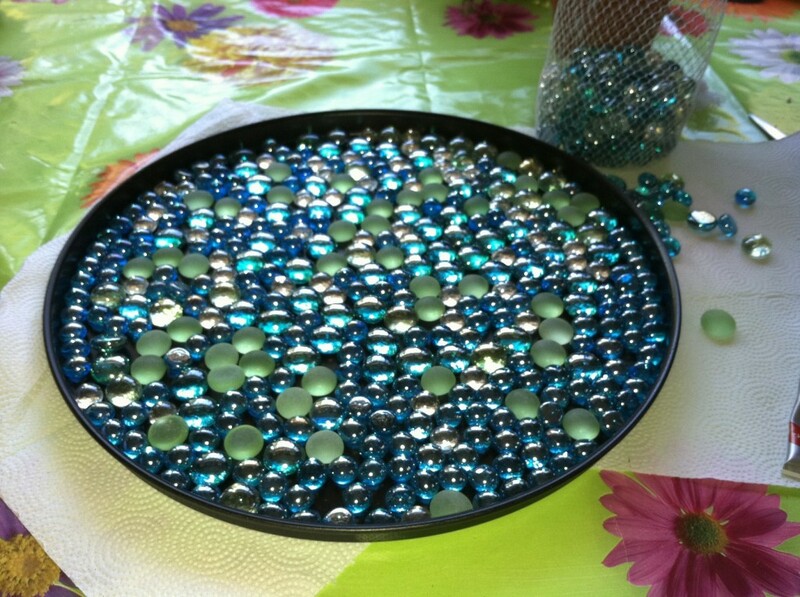 fit the flat backed glass marbles into your pan. Make sure you have enough. If you prefer a shabby chic vibe, paint your tray flat off white and choose pinks and matte colored glass pieces. After your tray, whatever color you chose, is painted and is good and dry bring it in and assmemble your materials. 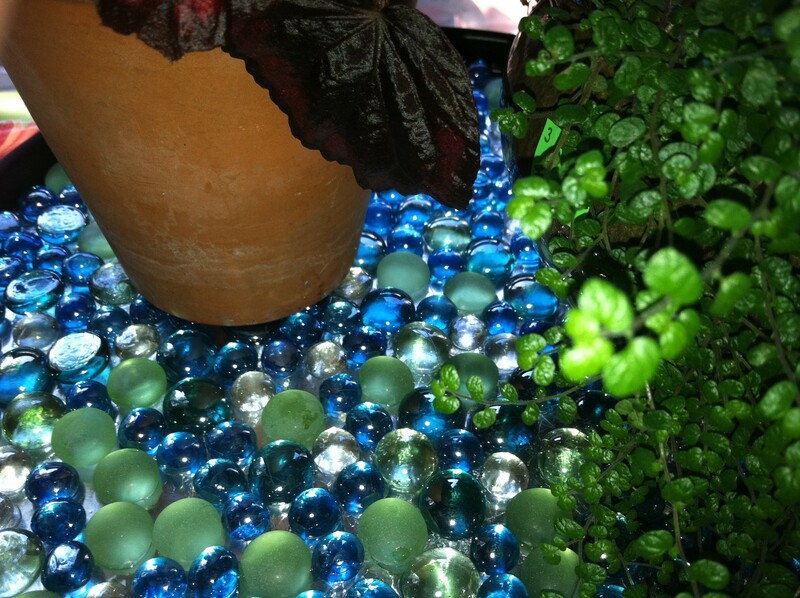 A few bags of those flat marbles in your favorite colors. Go solid, go water colors, go wild! A tube of E6000 glue, the best stuff on earth if you ask me, (get it at Michael’s and craft stores) some tinfoil, a popsicle stick for spreading glue and a pair of scissors to cut your foil. Don't worry about pattern, you are just checking for fit at this point. After you fit the marbles in, pour them back out and get your tinfoil out. Flip the tray over and use the base for a pattern. If you push the foil down where it meets the edges of the tray it will leave a mark you can use to cut out a piece of foil to fit inside the tray. Foil laid out on the back of the tray to figure out what size to cut it. 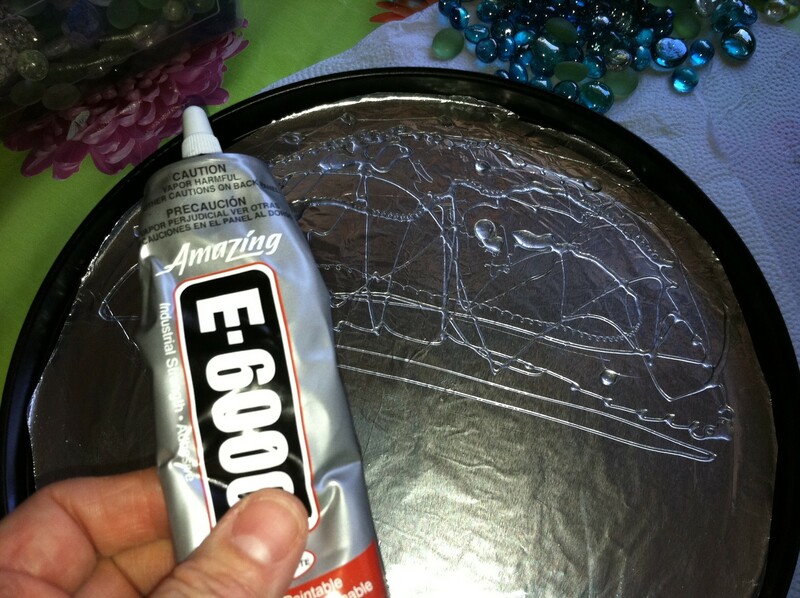 Cut out your foil, check the fit and squeeze some E6000 around your tray, especially around the edges. It doesn’t take a ton of glue. 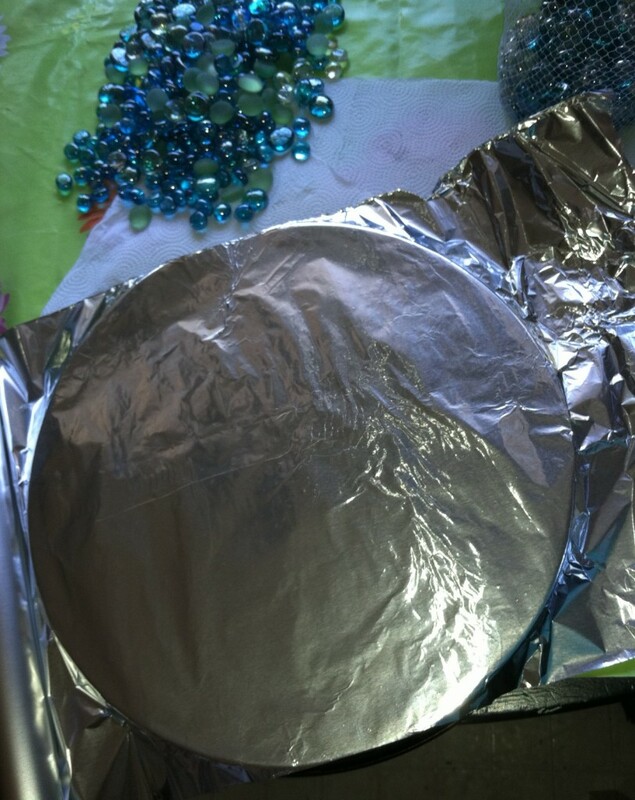 You aim is to securely fasten down the foil because you are going to glue on top of it. The foil back gives an extra bit of waterproofing AND it reflects light up from the bottom of the tray for a little gleam of silver. Time to stick down your glass marbles. Now, glue and goo the inside of the tray and stick your marbles flat side down all over the tray into the glue as close together as possible. When you are done, tip the tray up gently and find any that are loose. 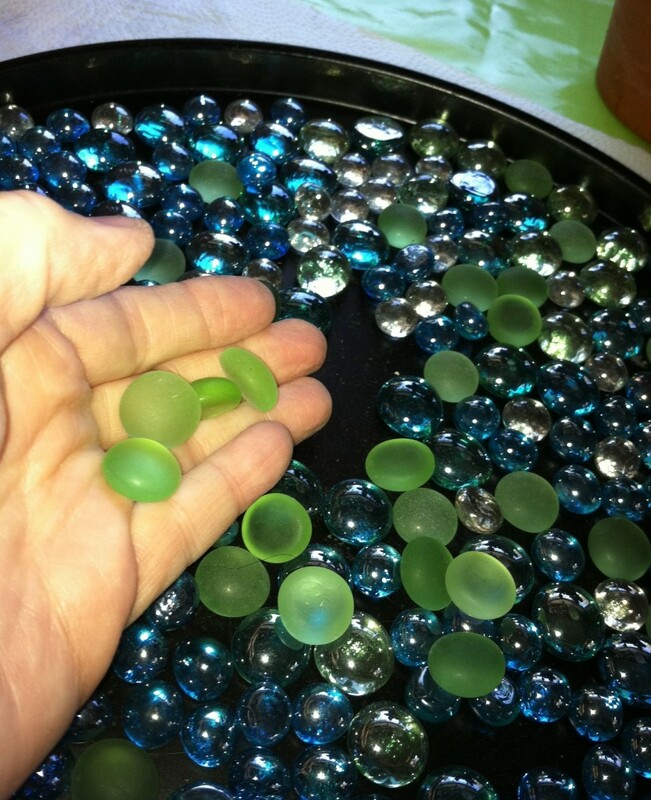 Dab glue on the bottom of the loose marbles and stick ’em down. All finished with a silver back for a little extra relection. The foil should only be on the bottom of the tray, not the sides. Pat and flatten the whole surface to make sure they are all set. Then take the next 20 minutes and peel the glue off your fingertips. Arggh. All done! 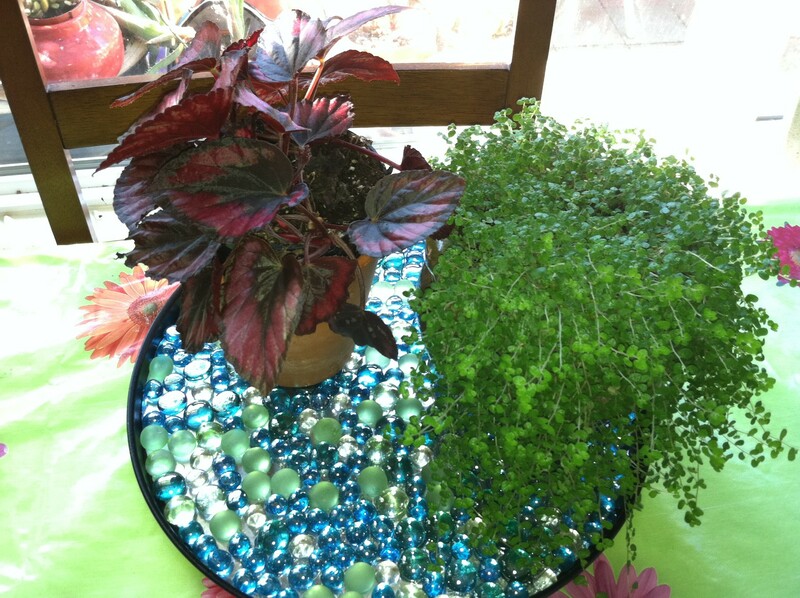 Put the plants on the tray and enjoy your new pretty and waterproof plant protection device. 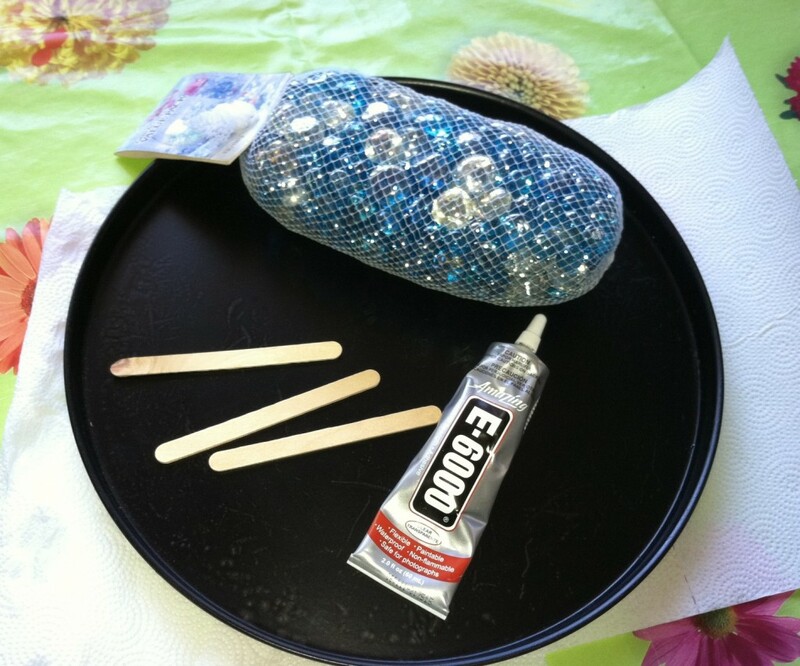 Easy, under ten bucks and possibly a good project for an older child –with good glue skills to tackle. Happy constructing! This entry was posted in Directions for making cool stuff and tagged directions for making plant trays, instructions for making a plant tray, plant tray project for glue savvy kids, recycled plant tray directions on October 17, 2011 by rox.